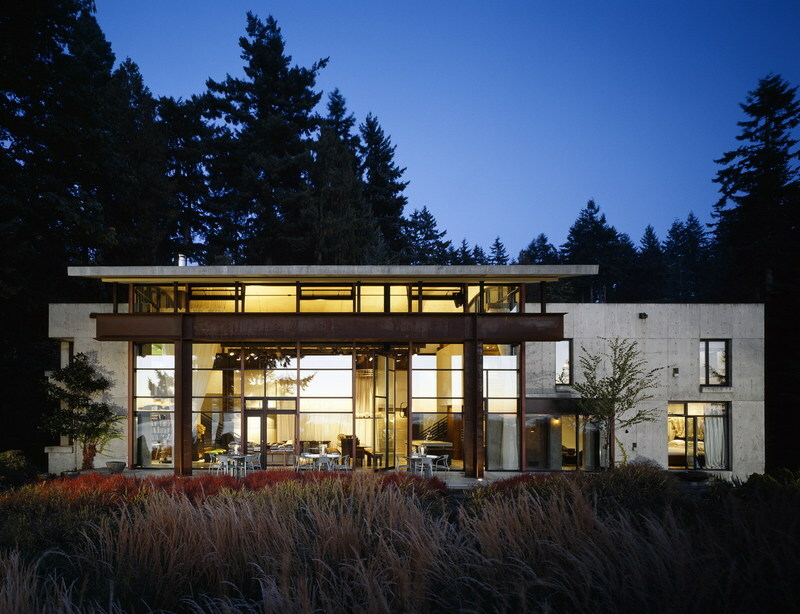 Principal of Seattle-based architecture studio, Olson Kundig Architects. Kundig recently toured Australia as a guest of the excellent C + A journal, presenting insight into the origins of his unique architectural philosophy and the raw yet intricately detailed projects that result. He discussed his formative inspirations, mostly derived from non-architectural fields and experiences, all tied strongly to the rural area of his childhood years: the lightness and elegance of rock climbing the Cascade mountains, as well as the craft of its equipment; the use of gravity and creative mechanical solutions for mining and mineral extraction; the exploitation of hydraulics and lever pulleys in timber logging; the fine line between high- and low-brow art in hot rod building. 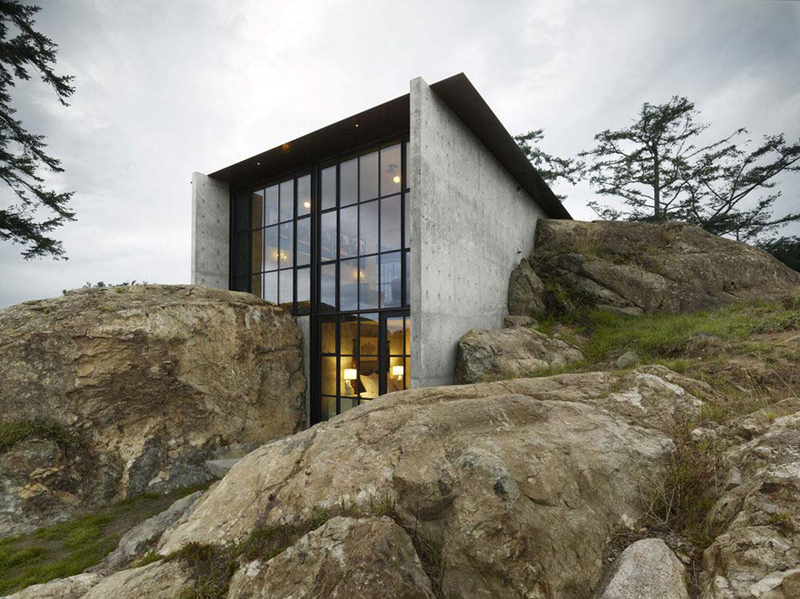 The projects that have followed are all recognisable extensions of Kundig’s inspirations. They are not only sublime, but reveal a practice of architecture dedicated to uncovering the unique. The gizmos for instance that have helped establish his international reputation are not in fact achieved by his own hand. Instead, the practice employs a mechanical specialist to convert Kundig’s simple sketches into jewellery-like systems of tractor parts, balanced weights, pulleys and hydraulic valves. 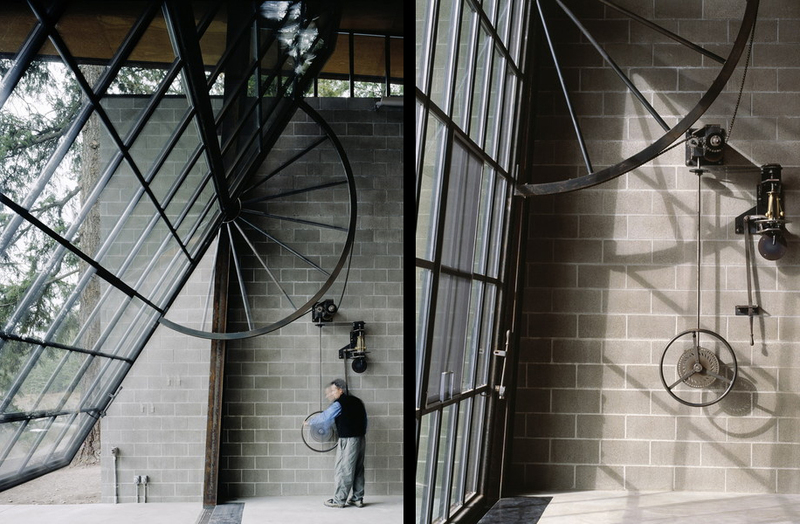 To reiterate: Olson Kundig Architects employs someone whose sole responsibility it is to craft mechanical gizmos. No drawings, models or specifications: just tooling away in a workshop all day making machinery. Surely that’s the clearest sign of an architect’s self-conviction we’ve ever seen. 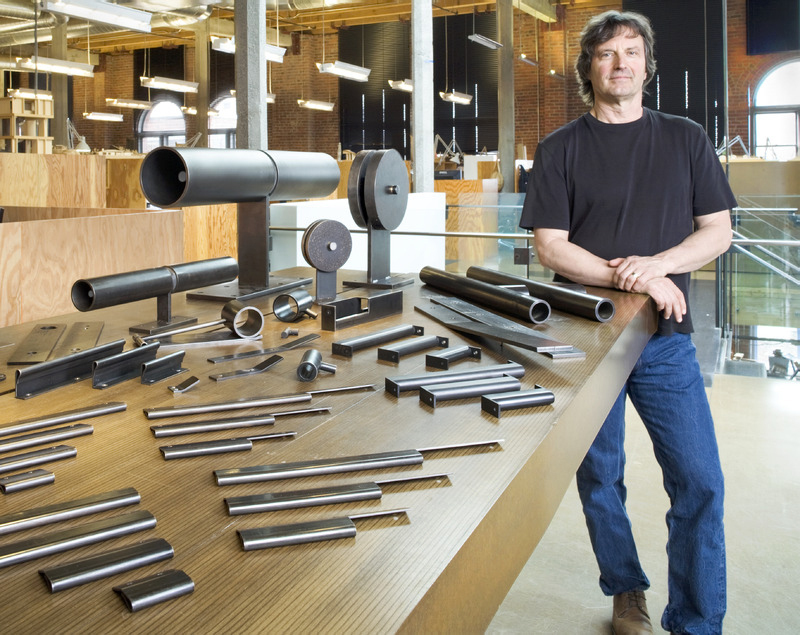 In his dedication to the hot rod-inspired gizmo, we think of Kundig as a type of concrete poet. He understands that precious little of architecture is mobile – usually just doors, windows, joinery and fixtures – so invests all his energy into making those parts sing. His use of the most basic materials – steel primarily, untreated and unfinished – reveals the desire to return to the first principles of physical delight, the joy and wonder of a child discovering the world for the first time. Put simply, we love Kundig’s work and have boundless admiration for its unique resolution. The silky concrete, untreated steel and intricate details of his designs, though never the same, are instantly recognisable. Simultaneously heavy and light, they are remarkable edifices evoking the passion for wilderness of America’s mountain heritage. Unlike Glenn Murcutt‘s much-quoted philosophy of touching the earth lightly however, Kundig’s work is anything but. The Pierre for instance involved chiselling, jack-hammering and dynamiting a large rock on site until it formed the core around which the house now pivots. 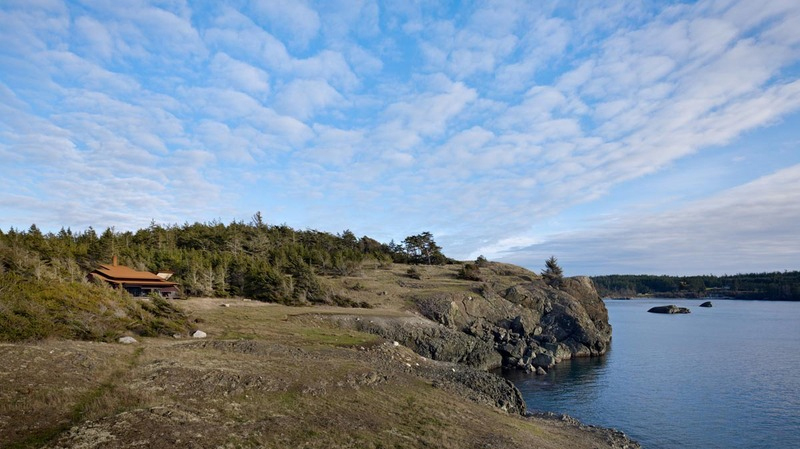 Instead of treading lightly, Kundig uses the land. His buildings develop a powerful symbiosis with their contexts, as much a part of them as the trees and rocks and lizards. They grow out of rock formations, stand cleanly amongst copses of threadbare cedars, and in the case of Shadowboxx House, nestle into the aggressively angled pine trees at the edge of wind-affected cliff tops. It is this preparedness to use the land that makes us think of Kundig as not only a poet but a butcher also. The boutique, high quality kind of butcher who so dearly loves the animal he kills that he ensures it is raised well, slaughters it painlessly, then uses every last part, exploiting the best qualities of each and wasting nothing. In loving the land so much, in understanding the nuance of each and every quality, Kundig recognises that his architecture irrevocably alters those qualities. His architecture strives to become a fundamental part of the land, to make something better of it. Beyond land and place, Kundig continues his close relationship with the act of making all the way down to the smallest of details. He spoke repeatedly of striving to avoid the inevitable commodities of architecture: off the shelf taps, towel rails, door handles, joinery handles, caster wheels. Like Frank Lloyd Wright before him, he replaces the commodities of a building with once-off creations, as much a part of his designs as the walls and windows. Fireplaces and bathroom sinks feature heavily, beaten from mild steel or even roughly carved from a fragment of rock blasted from the site. A door handle may be a simple strip of copper peeled back from the door’s surface and folded to fit the shape of a hand. A staircase may be welded from sheets of raw steel, their fabrication marks left as evidence of their recent extraction from the ground. In time, these marks fade as other marks of use are revealed. Steel oxidises, copper patinas, rock crumbles. Even in the smallest of details, Kundig’s work looks towards the specificity of place and the symbiosis of environment and architecture. He uses mild steel, not stainless, content to let the land take its slow, inevitable toll on its surface. The marks of use are augmented by the marks of the environment. Kundig may be famous for his intricate gizmos – and they certainly reveal a dedication to play and childish joy – but they are really just a single part of a more complex whole. 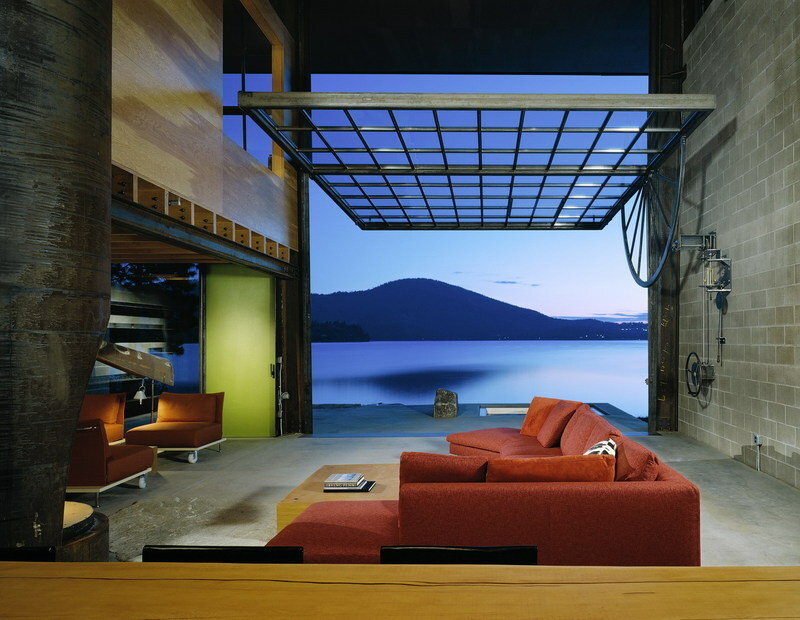 Kundig is inspired by both the natural and mechanical environments. In his works, the lightness of the climb and the basic laws of physics exist in harmony with the expedience of the farmer and the genius of the logger. He seeks to fashion holistic buildings where every part is significant, and has successfully generated a body of work reflective of an enlightened regionalism dedicated to the pursuit of fine craft. Kundig seeks to plug his buildings directly into the land that supports them. His modus operandi establishes an intensely intimate and wonderfully fruitful dialogue between land, client and architect. We hope that despite his practice’s surprisingly large size (100 architects plus support staff), he continues to invest himself critically in the design of fascinating architecture of great quality and honesty. Kundig is not the butcher! Butchery is parasitism, it consumes and destroys. 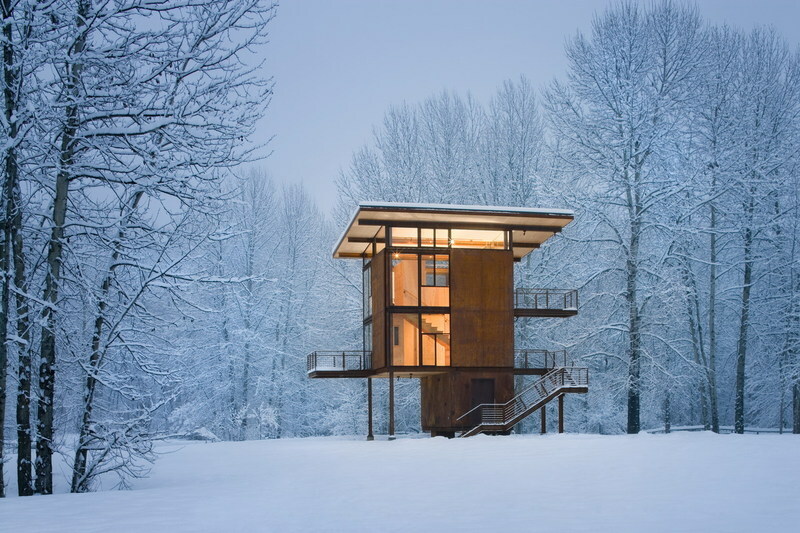 In my view Kundig is a creater, a builder of form, of place, of belonging but not a destroyer! He creates symbiotically and leaves enduring mutualism. His work is completely honest as is a rock or natural place, it is defined in a raw expression of materials, not divorced from their natural state but, rather reformed in an embrace of new expressionism. Where is the butchery in that? Thanks for your comment Christopher. Did you read the full article? I think you’ll find I have great respect for Tom Kundig and have used the term butcher to describe him in a very particular way. Absolutely Warwick, I read and very much liked the full article. You have indeed described him in a very particular way and my comments ignored the intention of your words! I wanted to pull away the expression of “butcher” from Kundig as his work is a constant intriguing study for me and, I am a vegetarian, hence my response was biased! The error is mine but, the pleasure of engaging with you on the subject of Tom Kundig is also mine! No problem at all. Kundig puts me in mind of a friend of mine who every now and then butchers an entire pig or lamb and then cooks amazing things from every last part, bones included. Utter respect for the life taken and celebration of the act of eating.